Overlooking the backbay waters of Estero Bay while sipping a cold beverage, it’s easy to understand why Flipper’s has been named the “best waterfront restaurant” on the island. For starters, the open-aired restaurant is one of the only restaurants on the island serving breakfast, lunch and dinner. The casual, laid-back ambiance is one you’d expect from a beach location. What you don’t expect is the exceptional cuisine that comes out of the kitchen during all three meal periods. This is NOT your typical island food. It’s a combination of fresh, classic items with flavorful sauces and perfectly cooked accompaniments. It’s no surprise that the food is so good. Executive Chef Juan Cruz has cooked alongside some of the country’s best chefs: Thomas Keller and Wolfgang Puck. The El Salvador native spent the past 20 years building his culinary career in some of the finest kitchens in the country, primarily in California. He moved to Southwest Florida less than a year ago to provide a slower-paced life for his wife and children. Flippers on the Bay is open seven days a week serving breakfast, lunch and dinner. 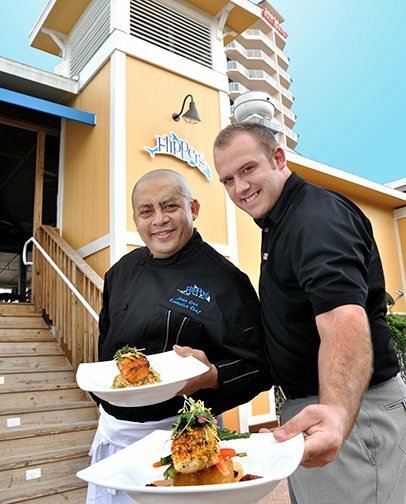 It has been named the “Best Waterfront Restaurant” and “Best Lunch on the Beach” in 2012. For more information or reservations, please call 239-765-1025 or 1- 877-798-4879.